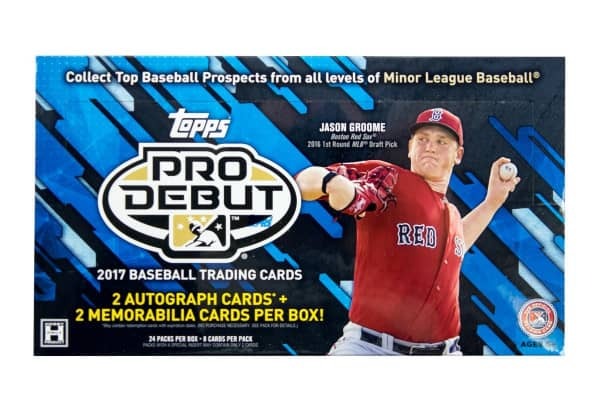 Factory Sealed 2017 Topps Pro Debut Baseball Hobby Box mit 24 Packs Per Box, 8 Cards Per Pack. In dieser Serie gibt es die ersten Cards von Tim Tebow ! 2 Autogramme und 2 Relic Cards per Box ! Produktinformationen "2017 Topps Pro Debut Baseball Hobby Box"
In dieser Serie gibt es die ersten Cards von Tim Tebow ! 2 Autogramme und 2 Relic Cards per Box ! The first cards of the 2016 MLB Draft class in their Minor League Baseball uniforms will arrive in May 2017. Topps Pro Debut Baseball returns in 2017 as the most comprehensive Minor League Baseball trading card release of the season. Compelling thematics such as In the Wings, an insert subset devoted entirely to the brightest young stars of Minor League Baseball, have been added this year to drive interest and collectability. Also look for specially inserted Promo Night Uniform Relic cards featuring jumbo-sized pieces of game-used promotional themed jerseys. Look for Autographs of Gleyber Torres, Mickey Moniak, Rafael Devers, Bradley Zimmer, Nick Senzel, Lewis Brinson, Ian Happ, Ian Anderson, Joshua Lowe, Zack Collins, Eloy Jimenez, and many more! Key Prospects: Cody Bellinger, Vladimir Guerrero Jr., Rafael Devers, Gleyber Torres, Mickey Moniak, Nick Senzel, Clint Frazier, Lewis Brinson, Brady Aiken, Franklin Barreto, Ian Happ, A.J. Puk, Victor Robles, Matt Manning, Luis Urias, Jake Bauers, Chance Sisco, Leody Taveras, Austin Meadows, Zack Collins, Blake Rutherford, Jason Groome, Chance Adams, Eloy Jimenez. Promo Night Uniform Relics NEW! : Showcasing jumbo swatches of game-used jerseys originating from popular promotional nights across Minor League Baseball. Pennant Patches: Featuring an organization's top prospect and a commemorative team pennant. 2017 Topps Pro Debut Baseball will continue to guarantee two autograph cards per box from a checklist loaded with up-and-coming baseball talent. Also look for Pro Production Autographs to fall at least 1 per case. Base Card Autograph Parallels: An autograph parallel of the Base Card. Splash of the Future Autographs NEW! : Low-numbered autograph cards of top tier Minor League Baseball prospects. Sequentially numbered. Highlighting each subject's most impressive statistical achievement. MiLB.com's Benjamin Hill has chronicled 15 of the year's unique Minor League Baseball events in 2017 Pro Debut. Look for these cards as well as a variety of additional compelling insert sets. Ben's Biz NEW! : Providing an insider's look at all Minor League Baseball has to offer. Promo Night Uniforms: Highlighting the wildest promo night uniforms from the 2016 Minor League Baseball season. In the Wings NEW! : Showcasing top players primed to make a substantial impact. 2017 Topps Pro Debut will also include specially inserted cards of the 2017 Topps "Make Your Pro Debut" winner! As always, Topps Pro Debut will showcase the 2017 Topps Baseball Base Card design. Look for a Base set featuring the year's top Minor League Baseball stars as well as the first cards of the 2016 MLB Draft class members in their Minor League jerseys. Base Card Image Variations: Look for limited image variations of top subjects' base cards. Weiterführende Links zu "2017 Topps Pro Debut Baseball Hobby Box"
Fanbewertungen für "2017 Topps Pro Debut Baseball Hobby Box"